Although it can be challenging to do circle time in a home school setting, particularly with an only child, I believe that circle can be a great benefit to your early elementary homeschooling rhythm of the day. Circle time in my family was an important warm up to the main lesson. It created that breathing transition in the morning that allowed the children to shift from an outdoor walk or morning household chores into the rhythm of more focused homeschooling. I wrote out my basic ideas for circle in my planner for each week to ensure that they fit well with the season and my main lesson plans. Ideally, the children are “called” to the circle in an imaginative, pictoral way. When my sons were in grades K-4, I had a little song that they recognized as the beginning of circle. My two daughters had an even more active song from “Let Us Form A Ring”: “Let us form a ring; dancing as we sing; let us form a ring; ringa-ringa-rayah; now we stand together; all sit down upon the ground; see the birds fly up and down; kickeree,kickeree, kee, kickeree ,kickeree, kee.” As the song suggests, we would hold hands and form a circle, moving first in one direction, then in another. Then we would stand still, then sit down on the ground, look up, and then stand up and kick our legs out, moving in the circle. Next, we would move to the little table beneath our smaller blackboard and light the candle for circle, using the familiar verse of “Here is a spark of Father Sun’s Light…..” and each child took turns (after learning how to strike a match properly) in the daily lighting of the candle. Then circle progresses to an alternation between a poem, a song and a second poem (or tongue twister). Often the first poem of the circle can be the Opening Verse that is used in lower elementary grades in a Waldorf school. The poems can be used for more than a week so the child learns them by heart and they can be related to the main lesson content or seasonal/festival content of the year. A good additional Waldorf resource book for poems is A Journey through Time in Verse and Rhyme, poems collected by Heather Thomas. Songs are also repeated daily in circle until the child knows them well. With my girls, we actually continued some aspect of circle through sixth grade because we all enjoyed singing together and the songs became increasingly more complex, moving from simple pentatonic songs, to rounds, to two and three part harmony. 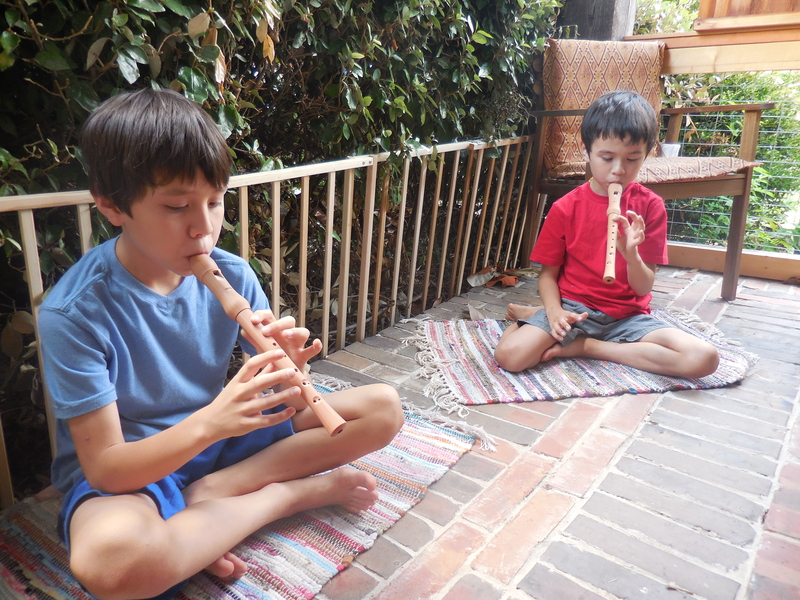 We also incorporated some recorder playing into this time period as well, but that is a matter of personal preference. One of the favorite parts of circle for all my children was what I called the big muscle movement that followed the second poem. We did all sorts of things during this time period, including simple playground games. Good resource books for playground games beyond Donna’s Joyful Movement are Child’s Play 1&2 by Wil van Haren & Rudolf Kischnick, and Hopscotch, Hangman, Hot Potato & Ha Ha Ha , A Rulebook of Children’s Games by Jack Maguire (not a Waldorf book). Another favorite was bean bag games, done after the child has completed making a bean bag as part of craft time. The children learned, over a number of months, a series of six different bean bag verses and actions that became increasingly complex. My girls loved jump rope games as well, and we had a big rope that I secured at one end and I turned the other end so both girls could jump into the big rope. We also enjoyed a variety of cat’s cradle patterns and hand clapping games. This section of circle could last up to 20 minutes. I called the children back to the candle after the activity and we sang or spoke a closing verse to end circle, blew out the candle, and moved into the main lesson work. My children felt refreshed and ready to focus after circle time. Homeschooling mom of five and Christopherus Homeschool Consultant.